Teacher Tom — “Teaching and learning from preschoolers” — is a joy to read, especially in this case, where we find him bravely confronting that modern day terror: A swing. When our school moved into its current location, it came with a swing set. It was about this time that playgrounds around the country were removing their old sets over safety concerns and there was some talk about whether or not we should keep it, but it didn’t take much research on our part to realize that there was little more than “catastrophic thinking” behind the removal trend. Like so many things related to children and education, adults had allowed themselves to envision the worst case scenario, freaked out about it, then sought to “protect” kids from their imaginations. We’ve been living with our swing set now for six years. There have been a few minor bumps and bruises, of course. They’re children at play after all and most things they do can result in bumps and bruises. Indeed, that’s one of the primary functions of childhood play: to give children an opportunity to learn, through experience, how to keep themselves safe, and part of that learning comes in the form of bumps and bruises. Well, did the school at least set up elaborate rules for who can play and when and how, and what about the 6″ deep mulch requirements that prevented this daycare center from allowing its kids on the playground equipment? We’ve never felt a need to create any particular rules around the swing set, even as we were tempted during our early years of living with it. We saw that the children figure out very quickly that they needed to be on their toes when playing around the swings, especially if one of the big kids who has learned to “pump” is on there. And there you have it. We can consider everything (and everyone) our kids encounter as potential dangers or potential learning experiences. Things that have been part of childhood for eons — swings, strangers, walking to school — aren’t suddenly more dangerous than ever. Nor are kids more stupid or fragile. Time to give them some credit — and some playground equipment. Turns out this is not a lethal weapon. Well, *something* has to be the most unsafe, if one ranks playground equipment. Eliminate swings and something else will move into #1. Yay for your school Tom – I wish they were all like this. Hey! A child slipped and fell on the curb getting out of her mother’s car a the end of a one-block ride to school. Skinned her knee. Gotta get rid of all those dangerous curbs. I once broke my ankle while waiting in a public library. Maybe we should outlaw them. Think about the paper cuts! But really the USA has the biggest bunch of babies I have ever seen. I sometimes think if something doesn’t change this country will be run babies in adults bodies. my youngest had her tooth knocked out by a swing at after school care. well it had been loosened a few days before when she was playing with a hammer and it ricocheted off a rock… So I guess I should have gotten rid of the hammer and had the preschool cut down the swing? she learned never to hammer rocks I can guarantee that. danger is big business!! $$$ Stay paranoid and they $$$ rake it in. Theresa, I’m actually terrified of paper cuts and cannot be rational about them. I got a cardboard cut while out shopping the other day, and asked someone if they thought we should call 911. She kindly talked me down. It’s funny – of all the things I played on as a child that last I would ever have worried about was the swings. It’s really unbelievable. But it’s heartwarming to see these things coming back. I love going on Youtube and watching old footage of public parks and playgrounds and seeing how different everyone looked. Sometimes you can see kids playing the way they used when I was a child and it all comes back to me. We can’t forget! Back in the late 70’s we had a device on my middle school playground called a ‘giant stride’. It was a 25′ pole with a turntable at the top, and 10 or so chains attached that hung down and ended with a handle. You grabbed the handle, and with 9 friends ran around a circle that was a about 30′ or so in diameter. Once you got moving, you could jump and take ‘giant strides’. It was lots of fun. But the best was to have one kid wrap his chain all the way around the outside of the other 9 kids. Now, when things got moving, the kid with the wrapped chain flew around the outside of the circle about 10′ off the ground until he dropped back into the ‘slot’ where his chain would normally be. It usually took two, or sometimes 3 revolutions around the circle for this to happen. You leaned right away to hang on *really* tight. It was dangerous as hell, and the best fun ever. Of course, there were rules about not wrapping your chain. It was universally ignored by both the kids and the playground supervisors. Like so many things, swings aren’t dangerous when used as intended, but can get made into dangerous things by kids looking for thrills. Jumping out of swings, either for distance or to do flips, is where all the swing injuries I’ve ever seen except for one came from. The other one can from twisting the swing up and then letting the person spin as the chains unwound… the “rider” put their body flat to get get the most out of the descent, and smacked their head on the riser. In a pre-school where kids only play on the playground with supervision, I don’t see either of these modes of play being likely. A few summers ago when I worked at Scout camp, we ventured into the nearest city for some weekend fun. We wound up at the local elementary school, where we found the most terrifying swing construction I had ever seen. We fondly called it the “death trap”–a ring holding the swings, where the swingers would meet in the middle. I suppose it was engineered that people wouldn’t crash, but oh, it sure felt that way. Last summer, I learned the swing still stands in that playground. I’m sure the kids love it. One of my students broke her arm last month lining up after recess. Today I received a note from a mom excusing her daughter from recess due to “delicate feelings”. Ah, the spectrum of life. My son’s school won’t let the kids run when they’re outside on the playground. Has anyone else encountered this? It seems crazy to me. It is not coincidental that the country with a for-profit medical establishment is so risk averse. For much of America, even with health insurance, an ER visit or consult with an orthopedist can tap out an entire monthly budget. We don’t want to be a nation of wimps, but we can’t afford typical bumps and bruises. Teacher Tom: he doesn’t wear a Superhero cape for nothing. @James Pollock: jumping off is the most fun thing you can have with a swing! 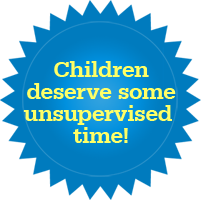 Seriously, it’s a fine example of a play activity where children intuitively and gradually extend their abilities and test their boundaries. Is it risk-free? No. Is it good learning? Yes. Is it fun? Hell yes! I sprained my ankle while sitting down, and then had to explain what happened to my insurance company when they were trying to find out if they could get someone else to foot the bill. Accidents happen. If I knew that was going to happen I wouldn’t have sat down that day. I hate to break it to you, but that isn’t an artifact of “for profit” medical establishment. That is an artifact of a “using other peoples’ money” medical establishment. The whole system is so bloated and distorted by government meddling and policy that not only isn’t it a free market, for profit system, it can’s see the free market from where it is. I am not sure the free market works where the consumer can’t deliberate or be price sensitive. Oh my God! Do some schools still have swings? Somebody call the fire department! It’s all fun and games until someone gets hurt. In my childhood, I managed to never get hurt seriously, but there were a couple of broken bones from jumping off the swings, and one serious concussion. After you get bored with jumping out of the swing forwards, the next challenge is do it backwards, executing a backflip out of the swing. If you catch your foot in the chain when you it, you come down head-first from about 6 feet up. Also capable of much danger when used not-as-intended… the simple horizontal bar, which can be used for “cherry drops” (hang upside down by the knees, swing back and forth, let go and (hopefully) rotate enough to land on your feet. Too easy on the high bar? Do it on the medium bar. Death (ok, faceplant) wish? Try it on the low one.) and the suspension bridge that was common on larger play structures of recent decades. The thing to do is the smallest kid stands in the middle of the bridge. four to six bigger kids jump from the ends to about 1/4 of the way across the bridge, all at the same time. Watch as the small child formerly in the middle of the bridge is launched high into the air. A move we did in junior high school… drag the high-jump pits next to the bleachers, jump from the top into the pit. Swings sets are great for practicing the laws of physics that these youngsters have not been taught yet, but will understand eventually in physics when examples are given, especially…Daredevil children (or those who identify with them – ahem – adults) like to leap at the end of the swing to practice their paratrooper roll while seeing who can go the farthest. Always wanted to see if the swing could go all the away around (no, but go see the Mythbusters episode on that if you are interested.) Pushing a swing and then running under is dangerous! Holy Cow! Cannot teach togetherness of working to get a higher swing or the pumping of legs to learn physics in an effort to get higher swings! If you do away with swing sets, how is the boy supposed to swing the girl as they are courting?! Courting is so overrated, physics is not phun and playing paratrooper is so not PC today, so ground the swings. If they are totally concerned with a risk free playground, take away the merry-go-round since kids are always caught trying to catch on to it, jumping off, or dragging their feet – all while it is spinning. Hate to use the centrifugal force principle with centripetal acceleration principle to have fun. Someone is bound to get hurt there. Can’t control that either so you must eliminate the merry-go-round or put a governor on the velocity that can be achieved through human horsepower! Maybe take away the slide for gravity on a surface increases velocity in a directional manner where feet, ankles and knees are always the first to be injured. Not to mention the hot summer days on a metal slide hurt too. Plastic can also get hot, but not the same. Can’t control gravity, so eliminate the slide (so much for airplane evacuation practice). Nothing is risk free and injury will abound, so don’t outlaw playground fun with items like these. If you do, how will the physical scars later in life (before they fade) be looked at with a smile and a story (even if embellished). Ah heck, ban the playground, send the kids to their safe spaces and remove any semblance of fun outside because of the weather, temperature, UV rays, other kids…..but that is for another day. So glad to hear about schools who are providing swings for children. Such an important part of childhood and child development. Thank you so much for this article. Children are missing out on so much because adults have decided that they must never, ever get a bump, bruise or cut. These adults then wonder why more and more children are having sensory issues, communication and cooperation issues. Children are not allowed to play for fear of them getting hurt. The number one danger of a swing on chains is that little fingers will get pinched or even crushed in the links. Solution: Take swing set down, cut PVC pipe of appropriate diameter into 2-foot lengths, slide a length down over each chain, put swingset back up. Also, getting kicked in the head is a very real danger. To solve this problem, tell the big kids to watch out for the little ones who have trouble keeping track of where they are in relation to the swingset and warn them if they’re walking into the danger zone. This has got to be the MOST ridiculous ideas EVER!! LET kids be kids!!!! When I was a kid, I took a few falls off swings at school. I survived, graduated high school, hold an Associate’s Degree and two Bachelor’s Degrees! In 2017, I will attend begin working on a Master’s Degree online while working full-time. Plus, I am assisting my 85-year-old Mom & nearly 83-year-old Dad. They are both ill. And they want to remain in their home! So, a few falls from a swing at school when I was a kid did NOT affect me. Swings are a PART of GROWING UP! LET KIDS BE KIDS!! QUIT CODDLING THEM!!!!!!! @Brian Lubbers–I remember the “giant stride” things you describe, from the late 80’s and early 90’s, when I was peak “playground” age myself. We called it a “Twirlybird,” or a “Whirlybird.” The only difference was, ours only had one chain coming off the pole, so it was a “one at a time” toy (probably to prevent kids from bumping into each other, or wrapping chains), but it was still fun. Are kids somehow inherently entitled to have that learning experience on someone else’s dime and with someone’s time? Am I obligated to install a swing set in my backyard and allow your children to jump off it so that they have the option of testing their boundaries every single time they play, although doing so will leave me the one financially responsible for their medical bills and actually responsible for dropping everything I needed to get done that day to tend to their injuries, should they happen, until parents can arrive? I work in a preschool in Denmark, and here we encourage the kids to go on the swing daily. Why? Well, it is great fun, and besides that we believe it is really important for the development of the children as well. 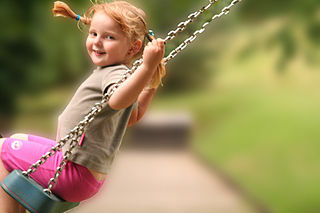 Swinging stimulates the vestibular sense. Now, what is that? It is placed in a small sensitive organ inside the ear.Why is the vestibular sense important for child development? Because it helps them to know where they are in space, if they move or stand still, how fast they move and in what direction. It helps them maintain balance and trunk control and successfully interact with their environment for fine motor, visual motor, gross motor, sports activities and self-care activities. Vestibular input can also help a child to stay focused and attentive. Over Thanksgiving weekend I visited my old elementary school which in my day had a fabulous playground. Even back then the “big spider” (jungle gym sort of thing) was off-limits because a kid fell and got hurt (notice: a kid – one). But we still had the little spider. We had a fabulous merry-go-round, two big metal slides, about a zillion swings and a number of other nifty climbing things. Now the little spider and most of the swings are the only things still there (and the crumbling blacktop where we used to play kickball – wonder if that’s still allowed?). The merry-go-round was gone last time I went, over ten years ago, but the other stuff was still there. Now, practically nothing, except two of the “most dangerous” things we had. The school on the rich side of town has a brand new playground with that squishy surface and fully safe (for now – who knows what we’ll find later) climbing apparatus. No, but some kids are going to test their vestibular sense no matter what–if the playground equipment is "safe" to the point of being boring for anyone past toddler age if used as intended, the kids are going to do stuff like climbing on top of the monkey bars, tunnels, et cetera, or jumping off the top of the play structure, or playing tag on the play structure with their eyes closed (yes, I've seen this). Or, even if there's no equipment at all, they'll do gymnastics moves (cartwheels, et cetera), on the grass, on the pavement, down hills–anywhere where adults aren't looking. They'll skateboard or do parkour on stair rails and things, and that's just a few things I can think of off-hand. Yes, they'll get hurt, but they'll also get stronger, and they'll ultimately be better off. Other kids won't do those things, and they'll be content to sit around and play on their electronic devices. So, I say it's six of one, half a dozen of the other. If anything, I think kids would be safer with more challenging playground equipment, that's still fun if used "correctly," because at least that way, it's somewhat possible to determine the risks at hand. If kids have to keep coming up with creative ways to take risks (because they're hard-wired to do so), that keeps the adults guessing. The Richland School District is mine. This last summer they took out all the remaining swings, and the slides at the one school that had a metal slide. Now they only have those play structures. You cannot go on top of the monkey bars. The slides are all of about 3 feet off the ground. The new schools that got rebuilt came with new plastic play structures. You realize this is a pre-school, right? With pre-school-age kids? There’s probably not a lot of parkour at recess, and the property is undoubtedly fenced, so not a lot of danger from after-hours play, either..
My days in elementary school (late 70’s) included much time on swings and various climbing structures. I have vivid memories of falling flat on my back from equipment taller than I was and having the wind knocked out of me. After a few minutes recovering I would be at it again. One of my favorite activities was to walk down the row of swings while other kids were swinging. Most of them would laugh, but some would panic as they came toward me and I calmly stepped out of the way. I think that was good training for my suburban bike commute in automobile traffic. My seven year old great niece is into basketball. They have a league for seven and eight year old girls that practices on Saturday morning and plays their games on Sunday morning. I usually run one of the game clocks on Sunday. They have scaled down courts and the baskets are a bit lower and larger in diameter. A week ago Saturday, a girl was looking at the ball instead of where she was going and got in a wall’s way. Last Saturday the same girl comes to practice with a cast on her left forearm ready to play. Her Mother said “Let her play. The doctor says that it’s OK.” The main problem is that the other girls think that her cast is cool and they all want one. Her Mother told me that she broke the same arm the same way in Sixth Grade girl’s basketball. I did the same thing. One time my dad’s sister and her family were visiting on a weekend and my cousin and I headed to the playground. The school was right behind the house but the playground was on the other side of the school and so not visible from our back yard. By the time they arrived I was sitting up and breathing much better and obviously not dying. Teacher Tom writes the best blog about early learning. He posts five times a week.